In a village of Fujian, authorities illegally demolished homes of residents to make way for the construction of a new villa. A family that lost two properties attempted to fight for their rights, but was persecuted and had to go into hiding to escape arrest. A resident of Xialou village in Putian city of Fujian, Lin Wenxiong, lost both his residence and ancestral house in September this year. 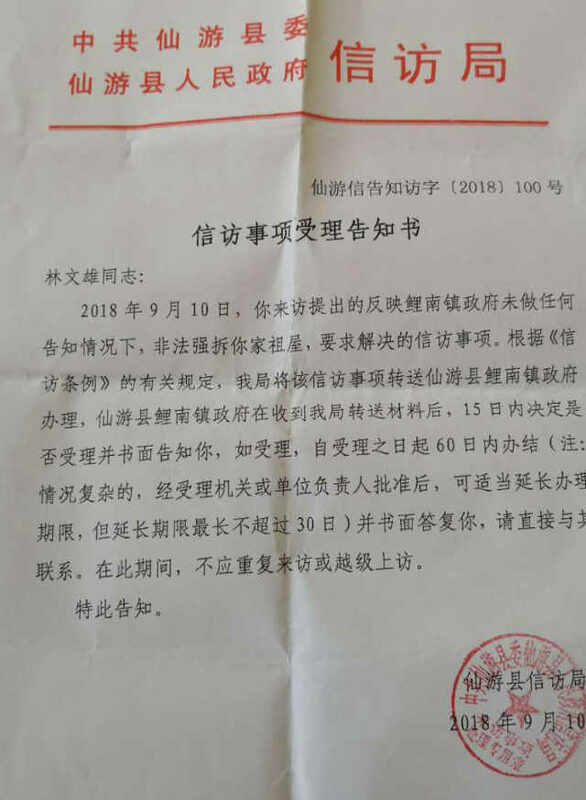 It all started in April when the local authorities of Linan county sent around a notice informing villagers that they have to relocate because their properties would be demolished to make way for a villa that would be built soon. There was no legal basis to their blatant demands, and all the buildings were built with official permits. To make sure the villagers obliged, government personnel would visit their homes frequently to intimidate them into signing approvals for the demolition of their properties. Many of them did. 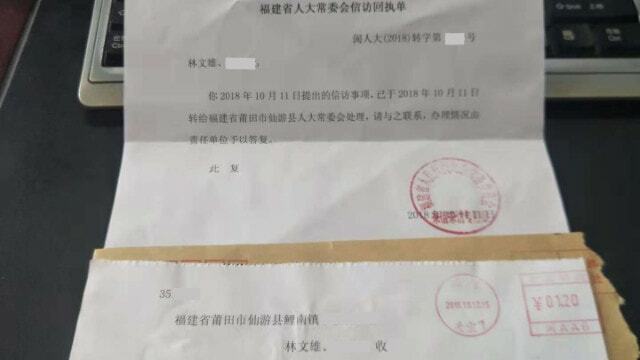 Real estate and land certificate for Lin Wenxiong’s property. 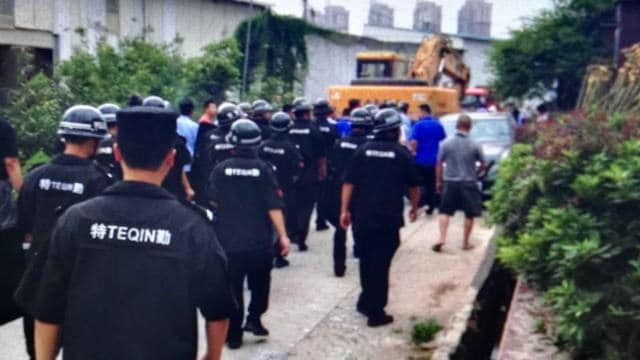 Ten days later, over 350 uniformed personnel showed up at Mr. Lin’s ancestral home, a house in the village that has been in his family for generations. The group included the town’s deputy secretary, mayor, and at least 50 hired thugs. Mr. Lin’s ancestral house was forcibly demolished soon after. ﻿ The same day, the authorities cut off water and electric supply to the house where Mr. Lin’s family resided. After the demolition of his ancestral house, he attempted to seek justice with the county authorities and later filed a complaint at the provincial Office of Letters and Visits, but his case was not accepted. Notification from Xianyou county’s Bureau of Letters and Visits. Letters and Visits receipt from the National People’s Congress (NPC) Standing Committee of Fujian Province. On 21 September, party secretary Chen Dejian showed up at Mr. Lin’s house with over 300 official personnel. Police tape was put around the building, as the excavators and forklifts were put in the ignition. Items were forcibly removed from inside the home, and three hours later, the building had been reduced to a pile of ruins. ﻿ Angered by this blatant persecution, Mr. Lin chose to expose the authorities by uploading a video of the demolition online. In response, the local government sent out orders to capture and put him on house arrest. He immediately went into hiding with his family, including two of his granddaughters, a five-year-old and a baby of few months. 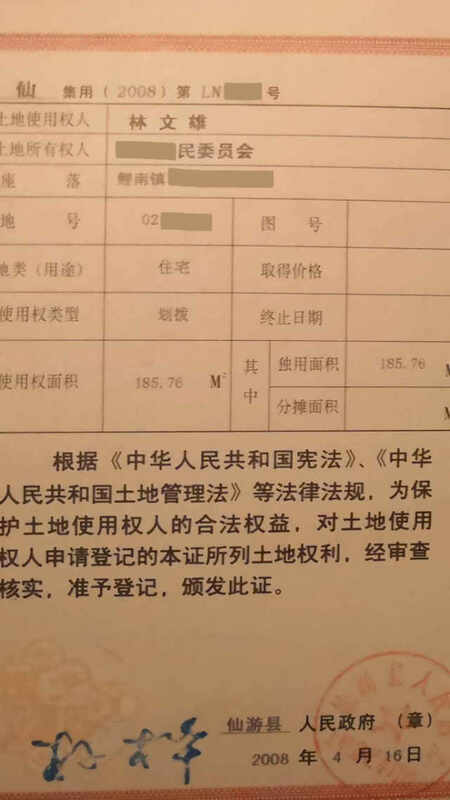 Other relatives were told to pass on a message to Mr. Lin that even if he managed to file a complaint, local officials would handle it at the end of the day. In that case, he had no choice but to surrender. However, Mr. Lin and his family are still on the run. Other villagers have been rendered homeless as well, as a result of these demolitions.